One of the great things about having a hardwood floor is that even when it eventually wears down and starts to show signs of age, you have the option of refinishing the material to revitalize it completely. This involves sanding down the surface past any finish or blemishes and then re-applying color treatments and seal. The finished product will look like a completely new hardwood floor and can be achieved for a fraction of the price of a new installation. Starts at $8.00 per sq ft and goes up from there. The price of a refinishing project is determined by the materials, the equipment used, and the number of hours of labor that it takes to perform the job. 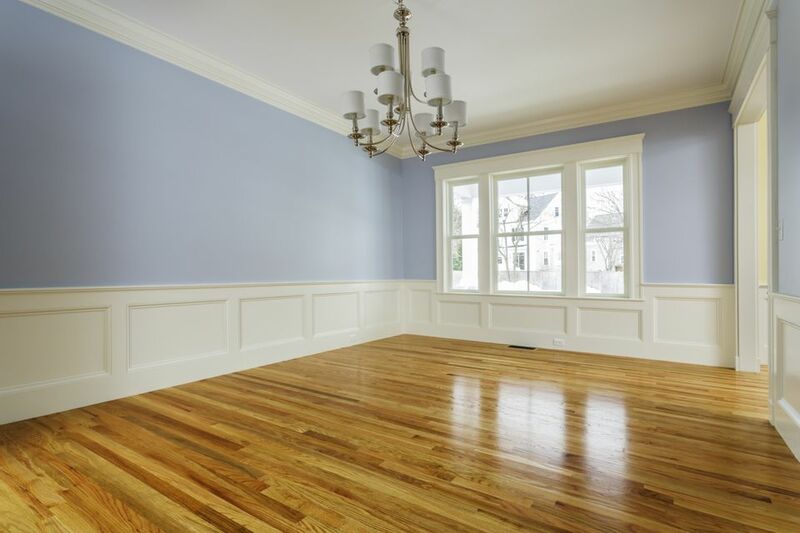 In general, for a basic refinishing job, it will take a contractor about 4-5 hours per 100 square feet of space. There are four major labor parts of a hardwood refinishing project that need to be accounted for in any estimate. This involves getting the floor ready to be refinished and will consist of things like repairing damaged areas, cleaning it thoroughly, and then ensuring that the surface is completely dry and free of any particles before proceeding. This is where you grind the material using a sanding machine to take the hardwood floors surface down below the level where any blemishes or treatments have penetrated. Once the floor has been sanded down, it will be like brand new, untreated material. At this point, various stain, or color treatments can be applied to decorate its surface. When the surface of the floor is sanded away, it loses any protective coatings which may have been placed in the past. This leaves the floor vulnerable to stains and water penetration. To protect it, one or more finishing coats need to be applied, creating an invisible layer of protection over the hardwood. Size Of The Floor: Generally, smaller rooms are going to be more expensive to refinish per square foot. This is because the equipment used to sand down a hardwood floor is usually quite large, and it is not easy to get it into or maneuver it through tight areas. Some small bathrooms, powder rooms, and laundry rooms may be too small to refinish at all without the help of a specialist with the necessary equipment. Location: In general contracting companies located in large metropolitan areas are going to charge more for a hardwood refinishing project. Reliability: Sometimes you will be able to find companies offering hardwood refinishing services at extremely low prices. Unfortunately, you usually get exactly what you pay for, and bargain basement offers may lead to shoddy work or jobs that take longer than they should. Repairs to these mistakes can end up costing more than the original project. Moving Furniture: The room you refinish will need to be cleared of any furniture or furnishings before starting the project. This is generally not included in the estimate of a project, and if the contractors have to take care of this themselves, they may charge a premium for the service. Another thing to consider is that if space is at a premium, you may end up having to move all of your furniture to one side of the room or house before starting the project. Then you will have to wait for the sanding, staining, and finishing tasks to all are complete and dry. At that point, you will have to move all of the furniture over to the finished side and start over again. This can not only prolong the project but can also inflate the cost. Cleanup: Refinishing a hardwood floor can be a messy process, and most of the time the contractor will not even offer the option of paying them for cleanup afterward. Because of this, you may need to factor in the cost of a cleaning service when determining the total expense. Repairs: If a floor is damaged beyond a certain point, refinishing it won't be effective. In this case, the floor will need to be repaired before it can be refinished so that the final look ends up being consistent across the entire room. Of course, this will drive the cost up as well. Removing Carpet and Other Floor Surfaces: Often there will be a hardwood floor lurking just beneath the surface of other materials such as carpet, cork, or vinyl tile. When these floor coverings start to wear with age, you will have the choice of replacing them or ripping them up, and refinish the hardwood below. If this is the case, make sure that you get an estimate for the removal of old flooring in addition to any other expenses. Average: $40 - $75 per stair. Generally, a staircase will drive the cost of a refinishing project up by about 50%. This is because they are very small surfaces, which require skilled, time-consuming, detail work to get them properly re-finished. One way to save money on a refinishing project is to repaint the balusters and rails and let them contrast with the look of the newly refinished hardwood. Mess: Refinishing a hardwood floor is a very messy and chaotic endeavor. It involves sending sawdust flying indiscriminately into the air. This is followed by applying stains and finishes, which can smell terrible and be toxic to the interior air quality of the space for short periods of time. With extensive projects, people sometimes opt to leave for a few days while the dust settles and the fumes clear. Thickness Of The Hardwood: You can refinish most hardwood floors several times over the course of their life. However, eventually, they are going to wear down to the point where they are too thin to be sanded down again safely. Generally, you want to have at least 3/4” of material or more left when starting this project. In some cases, professionals may be able to work with slightly thinner margins. Humidity: If you happen to live in a very humid climate then the process of drying stains and finishes can take significantly longer. This may mean that the project stretches out over more days, making the rooms inaccessible for long periods of time while they dry. Refinishing hardwood is a relatively easy project that can be undertaken by anyone with some experience handling power tools and performing DIY projects. The machinery used to do the sanding can often be rented from your local hardware store, along with the purchase of sanding pads, for about $300-$400 in total. You will also have to purchase stains, finish, and any brushes or sprayers that will be required to apply them. Remember that it will take a professional about 5 hours total to refinish 100 square feet of flooring, so factor in the time commitment when deciding whether to do this project yourself.